The history of Western classical music in China dates back barely a century. Several Chinese composers emerged in the middle years of the last century who wrote music in the Western tradition strongly flavoured by Chinese elements – especially scenery, poetry and folk tradition – before the Cultural Revolution put a lid on it, and it seemed as if Chinese music was destined to revert back to being a purely domestic concern. But Mao’s hostility to western influence in music backfired spectacularly, and in the 40 years since the end of the Cultural Revolution, Chinese composers have not so much been emerging as bursting on to the international scene. Music by Bright Sheng, Tan Dun, Zhou Long and Chen Yi are to be found in the repertory of ensembles and soloists across the globe, and while these composers all live and work in the West, their music makes a deliberate attempt to celebrate their Chinese heritage in a language which is immediately identifiable as contemporarily Western. But what of those composers who lived through the Cultural Revolution and then chose to remain in China? Among the most significant of these is Jia Daqun who is currently Professor of Composition and Theory at the Shanghai Conservatory – incidentally the oldest music conservatory in China, founded in 1927, and, effectively, the cradle of Chinese interest in Western Classical Music. Jia’s story is a fascinating one. A native of Shanghai, his early interest in music was stifled by the Cultural Revolution during which he studied traditional calligraphy and painting at the Sichuan Fine Arts Institute. However with the end of the Cultural Revolution in 1976, his interest in music was re-ignited and he took up the study of composition. Whether this was because the study of Western music was once again permitted or because, as Jia has suggested, his eyesight was causing him problems, he nevertheless developed a style of writing which imported the principles of form, line and colour from Chinese calligraphy and painting. He has received considerable support from the Chinese government, which named Flavour of Bashu for two violins, piano and percussion, as the “Chinese Classical Music Composition of the 20th Century”. This disc, the second in a series from Naxos devoted to his chamber works, gives us all a chance to hear that work and identify what made such an extraordinary impression on the Chinese government. From the very opening, with the wailing of the violin, the explosive punches from the piano and the energetic knocks and scrapes from the percussion, we are thrust into the world of traditional Sichuan opera (“Bashu” was the name of states from which Sichuan was formed). Clearly this is music which wears its ancestry not just on its sleeve but allows it to permeate every sinew of its body. But vivid Sichuanese effects are not the sole musical feature of this intriguing score. Before we have reached four minutes into the first movement (“High Pitched Tune”), we are firmly in the sound-world of Messiaen, and with the motor rhythms of the piano and the interweaving violins of the second movement (“Veins in Rock”), we are revealed a musical language which derives as much from the masters of 20th century European music as it does from the traditions of China. We read that this movement depicts the “strength of the mountains” and the “changes in the mountains’ structure” so much a characteristic of the Sichuan landscape. Visual stimulus was obviously at the forefront of Jia’s mind, but this is music which needs no such picturesque imagery to justify itself on purely musical grounds. Perhaps only the third movement (”Masks”), which “is based on the different types of facial makeup”, seems to need its visual imagery to make sense. It is in the form of a disjointed dialogue between the two violins (Wu Shuling and Tian Junjun) with operatic effects from the three percussionists (Song Yuchen, Zhu Tianyao and Ma Li) and some reflective, Messiaen-like outpourings from the piano (Yu Xiangjun). It is a fascinating work, and one can only admire the dedication the six members of Ensemble Les Amis Shanghai in presenting it in such a powerfully committed performance. Counterpoint of Times is a four movement work for a conventional wind quintet in which Jia shows his fascination with musical theory and structure. It is tightly organised and coherently devised, employing a musical language which is unrelentingly atonal but which includes some effective instrumental gestures. Although visual imagery has no obvious part to play in the work – the movement titles are abstract (Prelude, Intermezzo, Scherzo, Postlude) – Jia’s commentary on the piece draws attention to the use of various mathematical sequences which hints at Jia’s background in fine art by describing the Golden Ratio, employed in the final two movements, as “particularly pleasing to the eye”. This may be abstract music, but it is abstract music with a whiff of the tangible. Despite the lack of titles for the three movements of the String Quartet, this is clearly more visually oriented. Jia recalls that he wrote it “to express the feelings and to communicate a wider understanding of Chinese spirits and culture”, and while the musical language is very much rooted in the late 20th century, with much use of tonal indeterminacy and harmonic ambiguity, the frequent use of instrumental effects – knocking on the cello wood and the very pliable melodic figures from the violins (notably in the second movement) – do add a feeling of Chinese-ness to it. The Han Quartet, faculty members of the Shanghai Conservatory, make a lot of sense from Jia’s complex score. 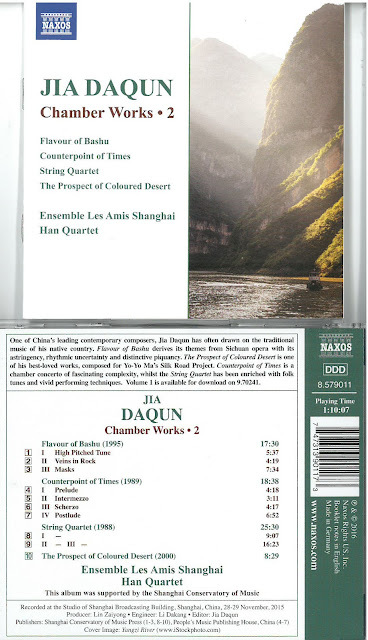 Only in the most recent work on the disc, The Prospect of Coloured Desert, does the multi-instrument Ensemble Les Amis Shanghai include traditional Chinese instruments – the Sheng and the Pipa. Commissioned by the Silk Road project, this work depicts a number of richly descriptive verses, and the music is clearly wholly concerned with evoking this visual imagery. As with all the performances on the disc, this is a model of concentrated and committed effort which serves the composer and his music extremely well.